Nowadays, Villa park has a capacity of around 43,000, but in it's hay-day held a record attendance of 76,588. Visiting fans are usually allocated around 3000 tickets, and will find themselves located either in the lower tier of the 'North Stand', or in the rather cheesily named 'Doug Ellis' stand. 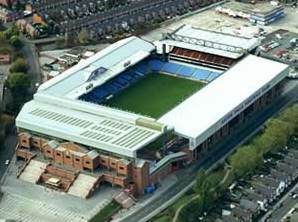 The first thing that you notice about Villa Park, is that it appears to be HUGE. Walking from Witton Station, and approaching the ground you are simply amazed at the size of the thing the Doug Ellis stand, appears to go on for miles. Once inside, you meet the usual features that you would expect to find in most stadia these days. There is a decent refreshment bar, properly integrated into the stand. A fair standard of food and drink is available (chips, pies, tea, Bovril, etc). But it's nice to know that the Villa staff have high regard for the visiting masses as they a greeted with a steel mesh grill across the serving area ? same also applies to the programme kiosk. Marvellous. Having only sat in the lower tier of the North Stand, you get a very good view of the pitch which is raised slightly. Legroom is virtually non-existent, so if you are quite tall, you may find it a tad uncomfortable. The ground has a kind of European feel to it with the concertina tunnel, the dug out benches and covering, along with the press fraternity directly above it in the Trinity Road stand. Overall, you can understand as to why Villa Park was for years, and still is, the venue of choice for domestic Cup semi's, such is the size of the ground, and extremely accessible via public transport. Well worth visiting if the opportunity arises. Leave the M42 junction 7 onto the M6. Exit the M6 at junction 6 onto the A38 (M) Aston expressway. Take the first exit right onto Victoria Road. At the roundabout, take the right exit into Whitton road, for Villa park. Take the M1 to junction 19, and then exit onto the M6. At junction 6, turn onto the A38, and follow the directions as above. Approaching on the M42, turn off at junction 8 and get onto the M6, heading towards Birmingham, and follow the directions as above. From Birmingham New Street Station (...the main railway station in Birmingham), change for Witton or Aston. This is a local service and takes about 5 minutes to reach Aston station, from where the ground in about a 10 minute walk (...follow the crowd as it's normally busy). A further 3 minutes on the train is Witton, which is closer to Villa Park (...about a 3 minute walk). Beware though... not all trains travel to Witton. The No. 7 is the bus that goes closest to Villa Park. You normally catch it outside the McDonalds in High Street in the city centre. It's about a 5 minutes walk from the train station and will stop at Trinity Road or Witton Island. You can also catch the 102 or 104, as these will drop you on Lichfield Road about 10 minutes away from the ground. Most of the street parking around Villa Park is restricted to permit holders only. Cars parked here also tend to get broken into, so we advise against it! The two main car parks are located at the Aston Villa Leisure Centre on Aston Hall Road, and the Brookvale Road car park (...located at the junction with Tame Road). You can also try the following local schools... Aston Tower on Upper Sutton Street, Mansfield Green on Albert Road, The Broadway School on The Broadway, the Manor Park Primary on Church Lane, and the Sacred Heart R.C. Primary on Earlsbury Gardens. Located on Village Road near Witton Station and offers all the usuals you'd expect to find at a chippy. The closest McDonalds restaurant to the ground is located in the 'Perry Barr' shopping centre, and is quite a walk from the ground. If you are a registered user then you can login, and create your own personal review of Aston Villa Football Club - Villa Park. These reviews can be private or public.